Work on projects this week has been moving along at a steady pace. Another few finishes on the board so we shall have a look at those first shall we ? 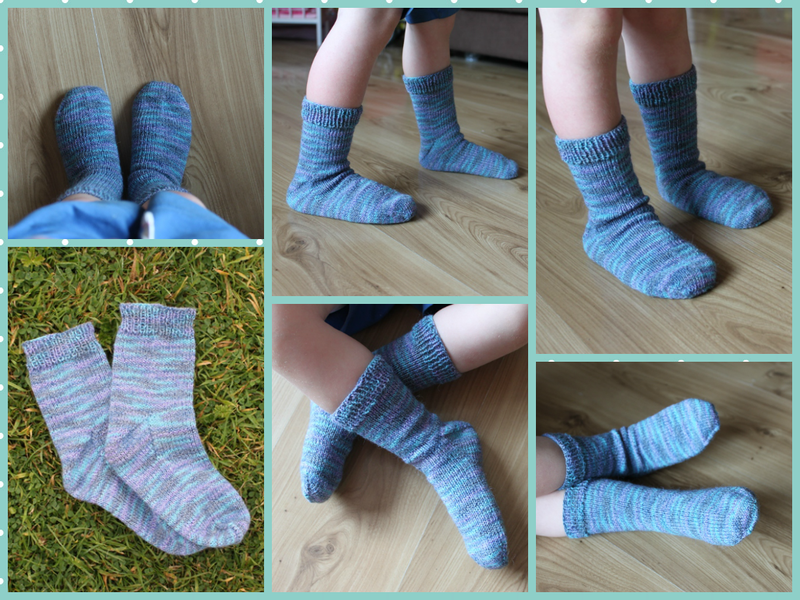 First we have the Ocean Blue socks for Benjamin. Here he is modelling them for me. I then got the urge to start something new so fancied some crochet work and took out the Anchor No8 cotton thread I’ve been eyeing for months in my stash. What to do with it ? What to use with it ? All these questions required research some months ago. I didn’t have the right size hook so needed to pick up that and I’ve only ever seen doily’s crocheted with thread. I did wonder if people used them anymore, in fact I am still wondering that ? I remember my aunt crocheting them when I was young, many wonderful ones so thought I’d give that a go. Found a free pattern on Ravelry called Tea Time, chose my colours and off I went one evening. Do you know how hard it is to see a 1.25mm hook !! It is TINY, it took some getting used to but by the end of one evening I’d done 8 1/2 rows of the 12 row pattern. Left it a night and came back and finished it off. I gave it a light blocking yesterday and here is it photographed this am. I also worked on Stormy Night, the beanie intended for James birthday next month. I know next month ! Have I ever been this early lol I don’t think so. The pattern did drive me a bit scatty. 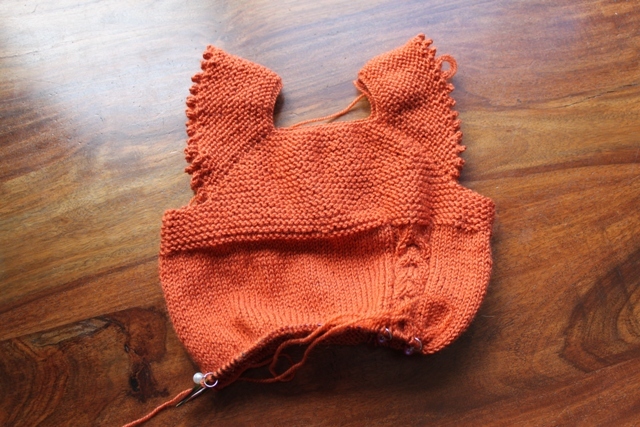 I found it easier to just look at the picture and just follow what was on my needles. I did like how it turned out in the end and I don’t think I need to worry about it fitting him as it fits me and Dominic modelled it for me this am. So that is all the finishes for the week. Not bad two wip’s started the previous week and one new start. I know this will slow down drastically once the children return to school but we’ll enjoy the productivity while it lasts. I also cast on yesterday the tea cosy commission I got. This one I’m calling Fresh Mint from the blend of turquoise and spring green I’m using to make it. The spring green just doesn’t want to photograph to well at the moment but here’s a peek at it. Projects this week will be both of these. The tea cosy being easier to work on will be knit during the day with the Copper Pot becoming my evening project. I also have the Fruit Salad socks cast on and I may work on those some more. Anyway, here is the list and how it is filling out already. There are links to my project page for each project with more photos and notes. Thank you all for your kind thoughts on Sam last week. It has been hard this week. This entry was posted in Crochet, Knitting, Yarn Along and tagged Copper Pot Milo, Crochet, Doily, Fresh Mint, knitting, Ocean Blue, Stormy Night, Tea at Sundown, Tea Cosy. Bookmark the permalink. Hurray for finished socks and a perfect beanie! I don’t envy you that tea cosy project – I’m so happy mine’s off the needles and can’t imagine casting on another one of those right away. The minty green is very cute with the blue. Your doily is very cute but it looks incredibly finicky. I have a spool of crochet cotton so I’m going to try one too. Imagine hooking an entire tablecloth or counterpane that way! Eeek I can’t quite imagine a tablecloth, I suspect it would be a real labour of love, especially if you saw the size of my table ! I love the little doily. My grandma used to have them all over her house. I suspect she made most of them herself and, if she didn’t, her mother did. I can’t even begin to explain how many she had when I was cleaning out their house last summer. I had to get rid of some. It killed me to do it but we don’t use them and she had well over 100 of varying sizes and shapes. So, I got rid of some, kept quite a few, and I hope that someday, we can bring them out for things. I have no idea what to use them for, though. Thank you and apart from decorating a table top or putting a vase or ornament on I’m not sure what else to use them for as well. But they sure are pretty. I love doilies and wish I had more of my Grandma’s. I have a few scattered around my house. Yours turned out great! 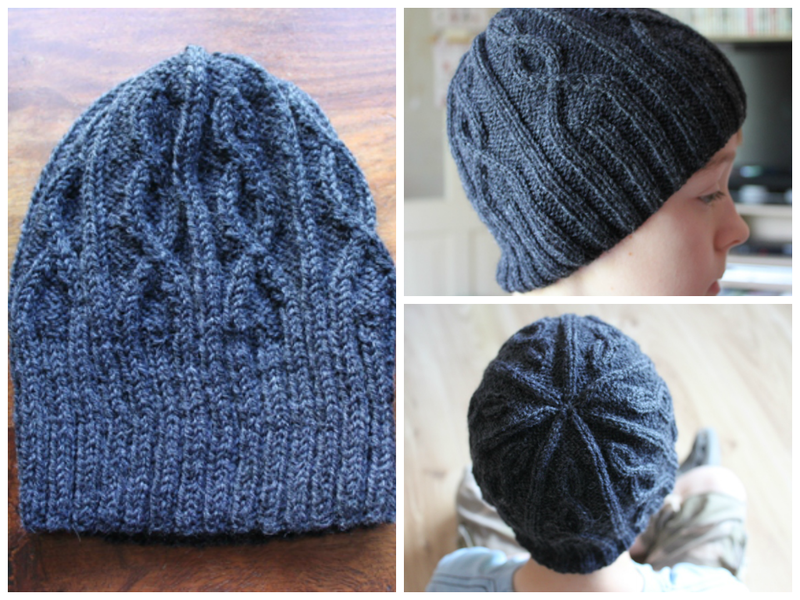 That hat looks like the Bend Hat pattern and if it is, I know what you mean about the pattern–I have one on the needles for Sam and it has given me fits too. Your posts Kim are never boring. I must check out the Bend Hat and see if it is the same. It would drive you scatty really. You still amaze me Ruth at what you can get done in a week. Congrats on all the projects and finishes. The hat is great. I love ‘cabely’ type items. I can imagine it was a beast with a chart though. I was able to see the green in the new tea cozy quite well. Lovely colors together and the name fits it perfectly. I was so sorry to hear about Sam last week. I was unable to post on anyones blog but just know my thoughts and prayers were with your family last week. Thank you so much, he was just so much part of the family. I to love cables, it is a toss up between them and lace as to which I prefer the most. Well done on all of your finishes! Your doily is beautiful but I don’t think I have the patience, although you did finish it fairly quickly 🙂 Love the colors in your new tea cozy! Splendid progress, Ruth! The socks are a terrific ocean blue. They fit your son’s feet so well. 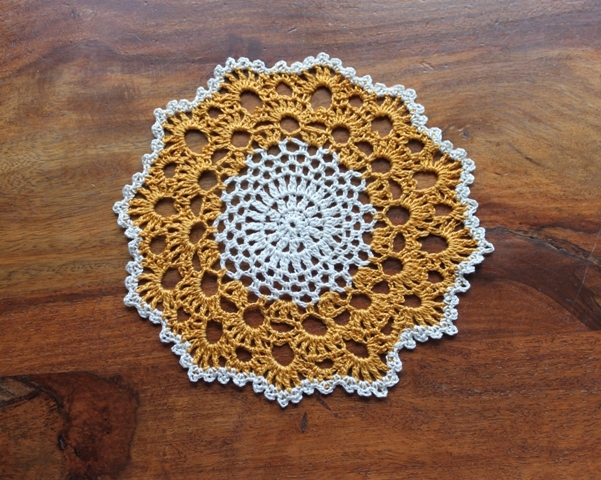 The doily is pretty! You can starch it up and either hang or frame it as art. The Milo vest straps are cute. They’re like angel wings. The hat is great. I love the cables. They’re strong and masculine. I think James will need a gansey to match that! I love how you used gansey and yes indeed he will need one. I will have to hunt one out. I came across a wonderful one for women with the most terrific cables and celtic knots ! I am fascinated by Celtic symbols. I think they’re so magical. I hope to make it to Ireland one day. I am so sorry about the loss of your Sam. They are so much a part of the family and memories and their devotion is amazing. I wish I could do something to cheer you all up but grief is personal and everyone has to get through it in their own way. Just know my thoughts and prayers are with you and your family. I would be lost without “my girls”. Will you look at you crocheting a doily! It’s gorgeous! In 2 nights? And the socks and the hat are really nice. Your shawl turned out beautiful and it is so delicate and feminine. Your clock is the cutest! And to think you are now a commissioned artist! Congratulations! And chickens? That’s the biggest coop I’ve seen! What a great project and your whole family will benefit as I imagine you go through a lot of chicken and eggs! Are you going to eat the chickens too or just use the eggs? You’re now Farmer Ruth! Oh, I love the picot on the Milo! Thank you Sam, yes the doily really came off the hook far quicker than I thought it would ! The coop is probably bigger than it would have been if we hadn’t already got that area fenced off but yes we will eat the chickens also, after all they will be free range and we will know exactly what they are fed and it is very important to know where your food comes from. Farmer Ruth, what a hoot that is ! Love the socks and the hat, they look great! And 1.25mm, that is small! I’m not sure I’d have the patience to use that, although I do have some thread I got in a mixed lot from ebay. Maybe one day when I can actually crochet! The hat and the socks are beautiful! They look so comfy 🙂 Your doily is adorable! I have the pattern on my queue list on Ravelry. LOVE Dominic’s hat. That grey is such a lovely shade and the hat looks like it’s going to last for ages. Beautiful work! Don’t know how you get so much done, you truly amaze me. The dolly turned out great, though no way am I gonna try it, not with these older eyes. I remember my Great Aunts having some too, they often used them under lamps on the tables to protect the tables back in the day. Wow, great job! You are sure getting a lot done.